Middle elementary readers love Margaret Davidson biographies. These engaging, short chapter books enable young readers to devour a book in a day (or a few), offering a sense of accomplishment and the personal satisfaction of "I did it!" Unlike many older biographies, some libraries are keeping Margaret Davidson treasures on the shelves, making them readily available--at least for now! Check out your library. Maybe you will find one of these gems living on the shelves. If so, borrow it! And, perhaps your family will be like ours. We've had several learners move quickly through these reads. They're well loved. Hence, this is one series we keep collecting for our home library. If your learners grow to love her work, consider adding them to the bucket list for your home library--the library that grows with your children. 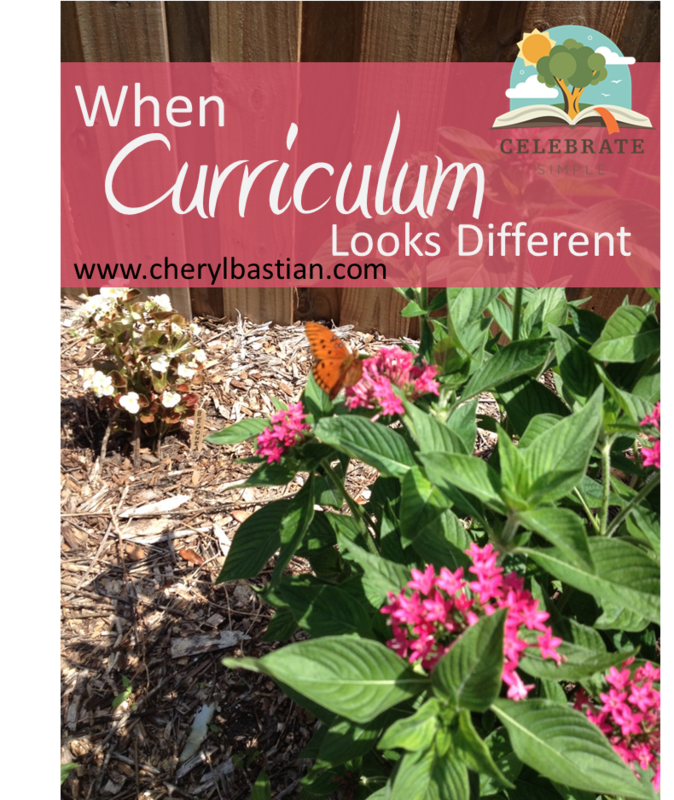 Cheryl will be presenting Growing a Home Library on Saturday, December 1 from 10am to Noon. The morning will be packed with practical helps and lots of book suggestions. Save the date on your calendar and watch the Celebrate Simple Facebook page for more details, coming soon! Looking for more posts about Living Books? 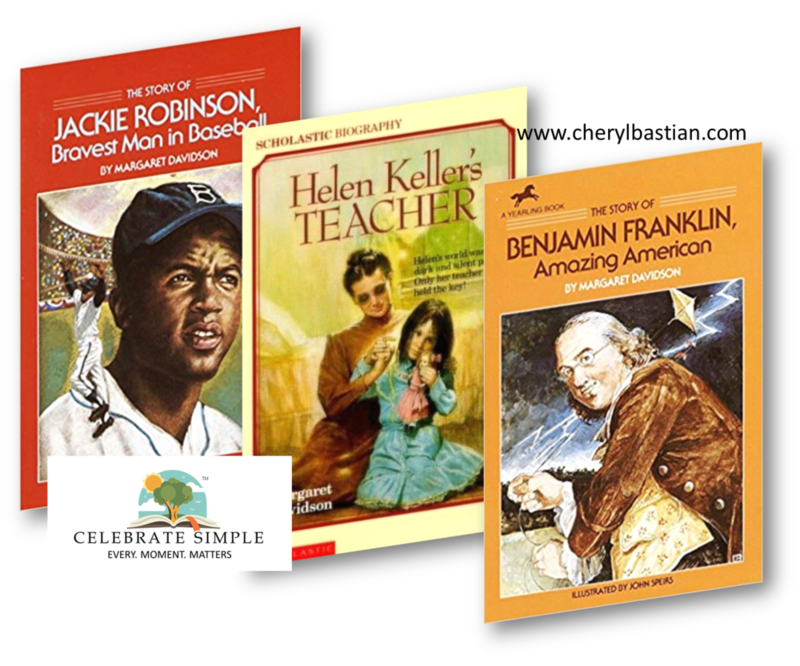 Younger readers may appreciate Discovery biographies (WIN-WIN for combining language arts and history) while older children may want to dig into an independent study. Parents home educating in the high school years may find this post helpful. A picture book is a work which combines literary eloquence with artistic merit--words and illustrations--working together to tell a story. Generally, picture books are written with 200-800 words (depending on the age of the targeted audience) on 28-32 pages. Historically, picture books have been written to the preschool through mid-elementary audience, yet these masterfully crafted gems speak to the hearts of readers of all ages. Wordless picture books. A wordless picture book is just that, a book without words. The illustrations alone tell the story, unless, of course, the person holding the book chooses to imagine and craft the text. One of the Bastian's favorite wordless picture books is Jerry Pinkney's extraordinary The Lion and the Mouse, a retelling of Aesop's classic tale. This treasure won the 2010 Caldecott Medal for its illustrative excellence. If your younger readers enjoy visual storytelling or prefer to create their own storylines based on provided illustrations, these wordless picture books may add some spark to your morning read-aloud time. Concept picture books. Little learners devour information, especially if content is presented with a twist of fun or catchy repetitive phrases and rhythmic rhyme. With this engaging, low-stress presentation, picture books can teach age-appropriate concepts (colors, numbers, opposites, and letters) to eager, curious littles. Children ages 2-8 enjoy learning concepts through topics of interest, for example, cowboys, insects, or construction vehicles. Concept picture books make this possible and do so through relaxing moments with resources which foster both early learning and literacy. Traditional picture books. I remember the librarian reading Blueberries for Sal as I sat imagining the smell of fresh muffins cooling in the kitchen. Through the unfolding plot of the the book, I could feel the fear Sal felt as she wandered off in the field and could no longer see her mom. Sal became my friend. I hoped she would find her mom, cheered her on as she met a mama bear. This is just one of the classics I associate with read-aloud time and school library visits. As a young mom, I couldn't wait to introduce my children to my literary pal, Sal. Traditional picture books invite readers into the story, into the lives of the characters. While reading, listeners develop empathy and understanding of others' feelings and circumstances, almost without knowing the transformation is taking place. For this reason, picture books become a child's first experience with the power of story. Together as a family, we've jumped into the plots of Make Way for Ducklings by Robert McCloskey, Tops and Bottoms by Janet Stevens, and Caps for Sale by Esphyr Slobodkina. Should you be a time and life season where you are building your home library, here are some must-have picture books to brighten up your shelves. 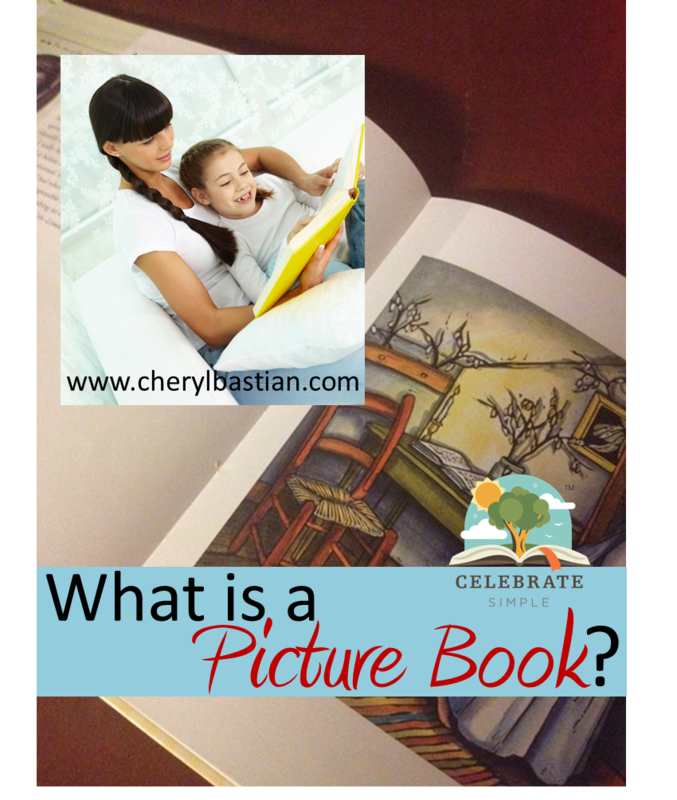 A picture book invites readers into learning and into the stories of others, gently, peacefully, and purposefully. There will be pondering. There will be wonder. There will heart-changing impact, sometimes so subtly it will go unnoticed for a bit of time. Some of our most treasured family read-aloud moments and discussions have come from the pages we've turned together. With each book selected, read, placed on our shelves, and the read again, a legacy formed. That legacy is sweet, precious, unique to our family, as it will be yours. That story legacy is a gift, a gift which will continue to span generations. It is just one benefit of keeping learning real and relational. I recently presented Picture Book Treasures at the 2018 FPEA Convention. If you would like more information on picture books and building a home library, the MP3 can be purchased in the FPEA store. Over twenty years ago, a veteran home educator suggested I read titles from the Childhood of Famous Americans series to my children. Doing so would bring history—real problems solved by real people—alive, she claimed. I purchased our first COFA and the children and I curled up on the couch to read. The book fueled questions, fostered wonder, and begged my children to read more. What a find! 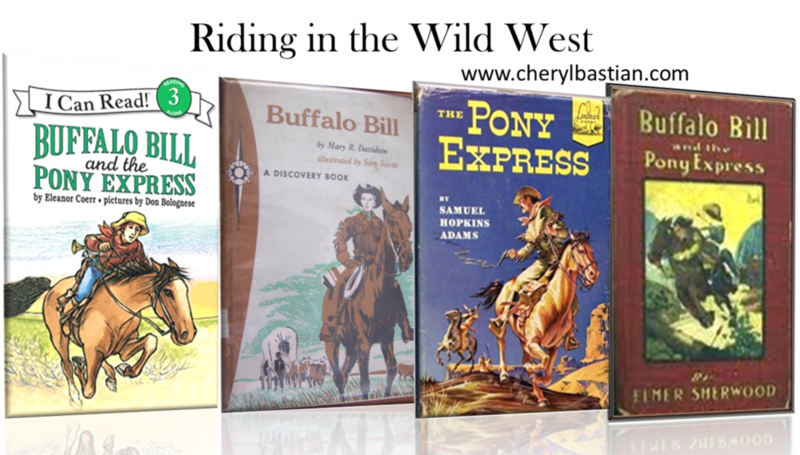 The Childhood of Famous Americans (COFA) series, praised by parents, teachers, and librarians for over sixty-five years, was first introduced to the public in the 1940s and continued to be printed into the 1960s by Bobbs-Merrill. Originally printed in hardback form, these fictionalized biographies (suitable for independent readers third grade and up or to be read aloud to any age) became instant favorites and were reintroduced in an infamous red, white and blue paperback form in the 1980s. These books have engaged my children since the early 1990's. Our family prefers the original hardcover books. Their large font invited emergent readers to read and allows younger eyes to comfortably read the text. Sadly, the hardcovers are now out of print. However, they can be found in online sales or in used bookstores. If we cannot get our eyes and hands on these hard-bound treasures, we look for the well-known red, white and blue covers. Over the years, whenever we began new unit of study or a learner developed a new interested, we tried to find a COFA title to personalize learning. These books have allowed our young learners to learn history through real people, real problems, and real solutions. When we study a specific era, I use this list. With over 170 COFAs to choose from, there is sure to be one to be woven into any study. Recently, the COFA flame was recently rekindled as one of my youngest children wanted to read about “real baseball players”. I immediately looked through the stacks of COFAs on our shelves. Indeed, we had a paperback cover copy of Roberto Clemente: Young Baseball Player and a hard cover copy of Knute Rockne: Young Athlete. I pulled those from our collection. I am thankful for that experienced mom’s recommendation to begin reading books from the COFA series. Since that day, we’ve been eagerly reading about the childhood lives of famous Americans, learning some very interesting lesser-known facts about people we have come to admire. The books are fictionalized, though based on information about the childhoods of these famous Americans. 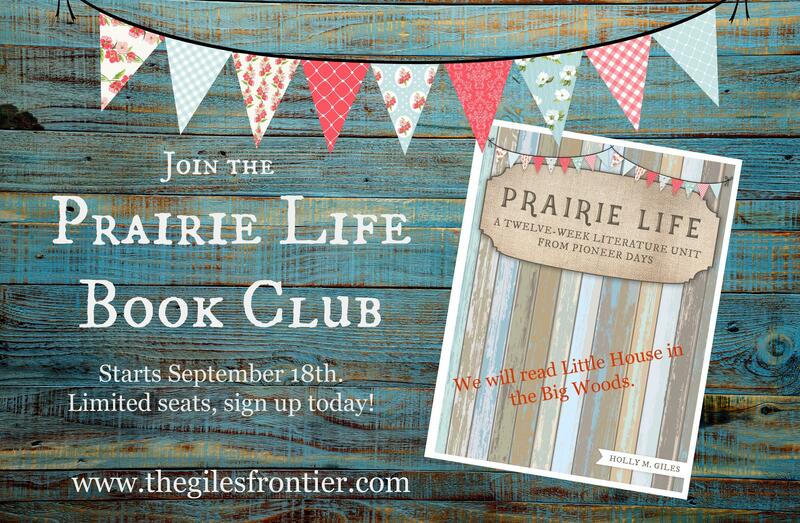 Children find the books inviting because of their focus on the childhood life of people they know only as adults. 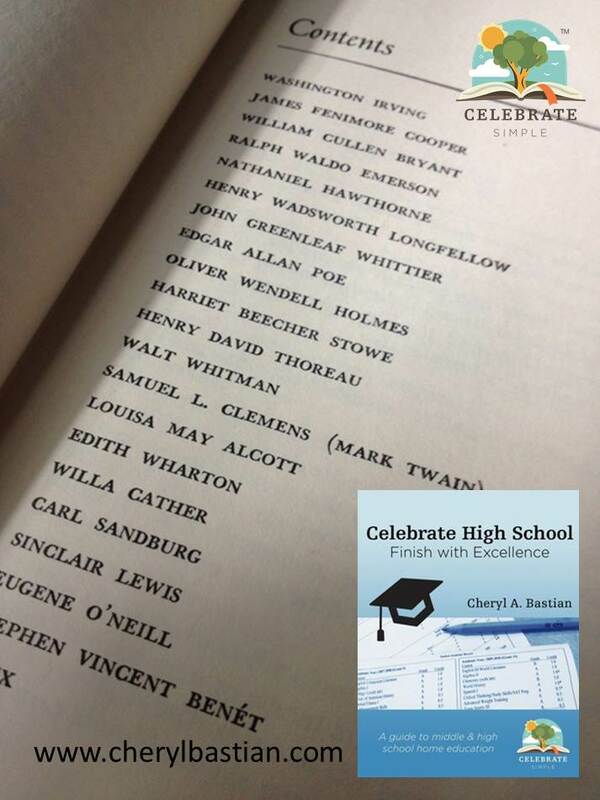 Each book is packed with noteworthy experiences, personality traits, and adventures from the growing up years of famous inventors, scientists, statesmen, and explorers. Children gain understanding of how a person’s experiences and personal gifts contribute to and impact the lives of other people. By the end of each book, the reader is left with the desire to find out what happened next, a perfect lead to further study. In recent years, several publishers are working to bring the once-out-of-print-titles back to life. A great endeavor, however in the process some of the books have undergone editing and rewording. One publisher, Patria Press, began reprinting the stories in 2002, renaming the series Young Patriots. Want to learn more about the heroes and heroines who shaped our country? Find a COFA title and relax on a comfy couch. You and your children will discover inspiring details from the lives of the men and women whom we often know only through their adult accomplishments. Several years ago, our daughter became interested in photography. A real interest, one she thought about every day and one that did not go away! She spent time researching and talking through her ideas about what she wanted to learn. Home educating, I knew she had the freedom to explore her interest as part of her day—every day—if she desired to do so. Though I enjoy photography and have a "creative" bent, I had no idea what concepts and skills would be included in a high school level photography course. Therefore, when she asked me what areas I thought would be included in a photography course, I knew I would have to join in the learning. First, I searched the Internet for syllabi of high school level photography courses. Reading, I discovered common threads. This was a starting point. Second, my daughter and I brainstormed additional content she wanted to learn. For example, she wanted to upgrade her camera. Researching the pros and cons of brands and features was definitely something she could include in her course. Third, we talked about what real-life experiences could be added: job shadowing, taking pictures of family members, learning and using editing programs, and shooting seconds for a professional photographer. Clearly, my daughter’s interest drove the learning. I simply had to be open to the ideas and be ready to encourage her progress. Before we knew it we had accumulated not only content but resources. Here is a snapshot of the content we developed. The outline above was the jumping off point. Once we had the major areas of study--at least a plan--we could adjust as we went along. For learners who appreciate the power of a story, these Living Books may be just the ingredient to bring additional life to the course. 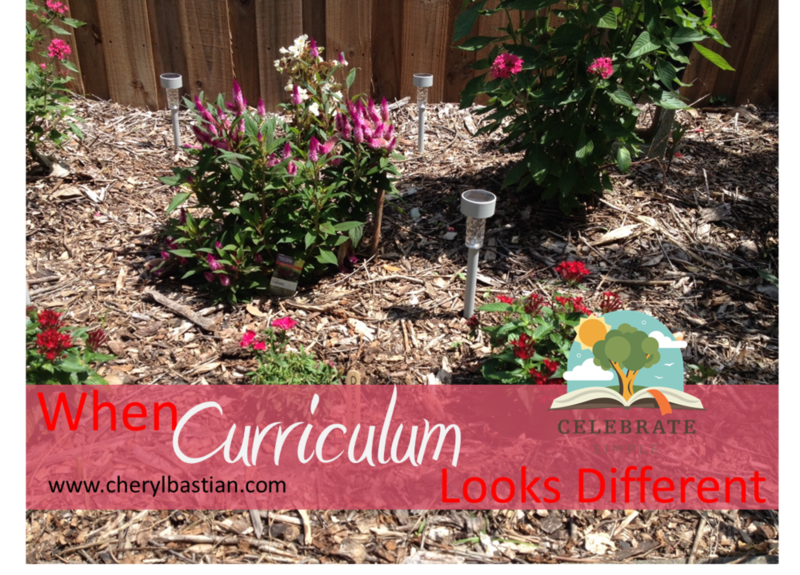 My daughter's interest led to elective credits, not one but TWO! When she finished these studies, she decided to take an online course. Once the interest is sparked, there is no limit to where the learning path may lead. Sometimes it is an elective. Other times the study leads to employment. The possibilities of high school electives is endless! If you will be attending Florida Parent Educators Association (FPEA) conference May 25-27, you may be interested in the two high school workshops I have been invited to share: Keeping High School ALIVE with Living Books and High School: Mission Possible. In addition, my husband Mike will join me at the podium to share The Real-Life Influence of Family Conversation and my oldest son and I will present an encouraging session, Thank You, Mom! FPEA is always a highlight of our speaking calendar. Can't wait to see you there!